VeganBurg kicks off the spooky spirit of Halloween with the launch of a limited-edition Thriller Burger. The flavours and aesthetics of the meal were created to distinctively bring back childhood memories of trick-or-treat adventures. 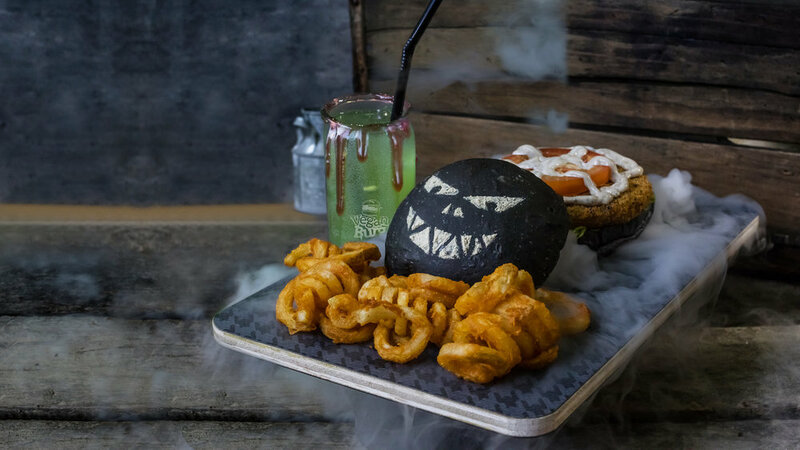 The Thriller Meal comes with Frizzy Fries and a Witch's Kiwi Brew, and served over dry ice for a bewitching and awe-inducing experience. SINGAPORE, 21 SEPTEMBER 2017 - VeganBurg kicks off the spooky spirit of Halloween with the launch of a limited-edition Thriller Burger. Paying homage to one of the most influential people of the decade, the Thriller Burger is named after Michael Jackson's hit, Thriller, and themed after the popular Netflix show, Stranger Things. For the month of October, VeganBurg will transform into a retro scare zone, recreating the spook and horror of iconic pieces of pop culture from the 80's. Whether you celebrate Halloween or not, the Thriller Burger is perfect for kids and the kids-at-heart. The scary tribute, embodying a headless zombie, boasts a ghoulish black charcoal bun head, crispy plant-protein patty innards, fresh romaine lettuce, hypnotic red onion rings, thick-cut juicy tomatoes, dairy-free aioli skeleton, and all resting on a puddle of bloody BBQ sauce. The meal will be served over dry ice for a bewitching and awe-inducing experience. The official launch date of the Thriller Burger is Monday, 2 October 2017, and will be available for a limited time only. Alex Tan, Founder of VeganBurg, says "The flavours and aesthetics were created to distinctively bring back memories of your childhood and trick-or-treat adventures. We're certain that customers of all ages will love the ghostly white experience that comes with every Thriller Meal. We think that the Thriller Burger is a fitting way to celebrate Halloween in a fun, healthy, and sustainable way." The Thriller Burger is priced at $10.90, and priced at $15.80 as a meal. The Thriller Meal comes with Frizzy Fries and a Witch's Kiwi Brew, served in a strawberry "blood" rimmed cup. The burger will be available at VeganBurg's founding outlet in Jalan Eunos, while supplies last. For more information, visit veganburg.com/singapore, or join the conversation with #VBThriller. © Copyright 2019 VeganBurg®. All Rights Reserved.